Melasma is a common skin disorder that results in dark, discolored skin. It usually occurs on areas of your face that receive a lot of sun exposure. Melasma usually occurs in young women who have darker or olive skin, although it can affect anyone. This skin disorder is commonly known as “pregnancy mask” because it can be triggered by estrogen and progesterone – the female hormones. Despite its nickname, melasma can also occur in those following a hormone replacement regimen, or women currently taking or utilizing hormone-based birth control. Melasma appears as a gray or brown skin discoloration on the face, usually on the upper lip, nose, chin, cheeks and forehead. In most cases, this discoloration is symmetrical and uniform in nature. Melasma can also occur on the neck and forearms, as well as other areas of the body that receive a lot of sun exposure. Melasma can be an inherited condition, as those with it tend to have a relative with this same skin condition. Also, while melasma is more of a cosmetic issue than a harmful one, it is best to have a dermatologist check for other skin conditions as well, just to make sure that the condition is indeed melasma. In some cases, a dermatologist will conduct a biopsy on a small amount of affected skin, simply to rule out more harmful conditions. 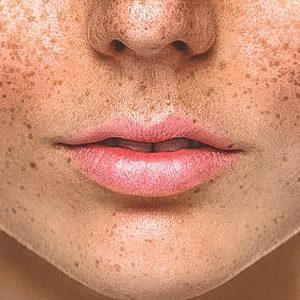 Melasma can be treated with a skin care regimen consisting of a topical cream that contains either kojic acid, azelaic acid, hydroquinone or trentinoin. Other options include dermatological treatments like chemical peels, Microdermabrasion, or laser treatments. Your dermatologist may recommend a combination of any of these treatments for more extreme cases. You will also need to avoid sun exposure as much as possible, and will need to include either sunscreen or sun block in your daily skin care regimen, since sun exposure can aggravate the condition. However, melasma can fade over time after childbirth, after stopping hormone replacement therapy or going off of hormonal birth control.